Jayapura 1/12 [Jubi]- The statement of the Vice-Captain of Papua Police Region, Police Brig-Gen Paulus Waterpauw to a national media source about the incident that killed a citizen of Depapre has been refuted by locals from Yongsu village, Depapre District, Jayapura Regency. The Police Vice-Captain said that there had been armed contact between a mobile brigade [Brimob] of the Indonesian Police with an armed civilian group in the Depapre area of Jayapura, killing one of the civilians on Saturday. Apart from that it was claimed that a Brimob member was shot in the hand. However when Yongsu villagers were contacted by Jubi on Sat 30/11 evening, they said there had been no armed contact in Depapre. A villager who didn’t want to give their name said that a villager named Eduard Okoseray  who worked as the village secretary of Yongsu, Depapre District had died from being shot by Brimob Papua forces. Another Yongsu villager who wanted his name concealed who was contacted by Jubi Sat 30/11 night said the same thing. ‘The event happened on 29 Nov 2013. Eduard was not looking after the operational aid money for the village. The District head facilitated police from Brimob. The Papuan police arbitrarily shot Eduard’. The event was also noted by Matius Murib, Director of Baptist Voice. Matius said, ‘the victim Eduard, male 40, was village secretary of Yongsu, a victim of Brimob brutality at Yapsi village, Depapre [29/11]. Pudjo also claimed that the police seized some evidence. 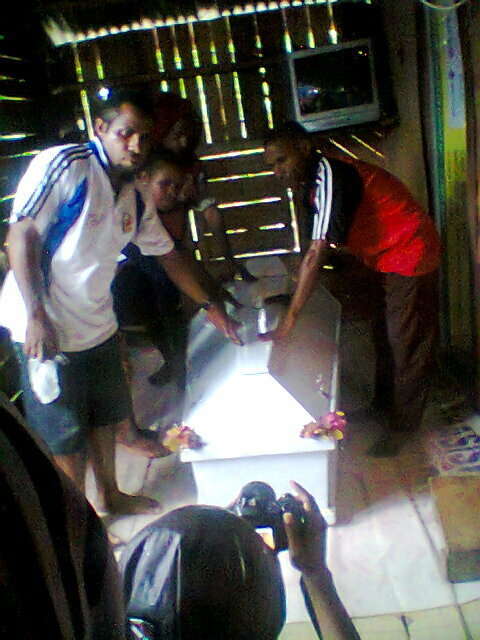 Jayapura, 28/11 (Jubi) – The family of Matias Tengket and the chairman of the West Papuan National Committee (KNPB) of the Sentani region has discovered the chronology of the murder of Matias Tengket who was found dead in the Kali Kamp Wolter estuary at Sentani Lake, a day after the KNPB mass murders by police, last Tuesday (26/11). KNPB received this chronology from a Sentani male citizen who was unwilling to mention any names. KNPB regards this male as an eye-witness. During the time of the event, the eye witness was fishing at the Sentani Lake which is likely to become a location for execution. This location is not far from the discovery of the corpse, still in Kali Kamp Wolter estuary, on the shore of Sentani Lake, behind the Museum or Expo Waena Pavilion, Jayapura city, Papua. The Sentani KNPB chairman, Alen Halitopo, stated that when the Police chased the crowd, Matias Tengket ran to hide from being physically harmed. He ran into a street on the edge of Kali Kamp Wolter reaching the estuary. “A black Avansa car chased him from behind. The car stopped in front of Matias. The people armed with weapons pushed and shoved him,” said Alen in Matis Tengket’s funeral home, in Hawai, Sentani, Jayapura Regency, Papua, Wednesday (28/11). At that time, according to Alen, there were children fishing. People who were armed with the weapons chased the away the children who were fishing by pointing their weapons at them. At that moment the children ran in fear and fled. One of the children who was at that time fishing told the events of the situation and also saw the immediate execution process of Matias. “He saw, while running, people pulling Matias onto a boat. They struck him with the end of a weapon,” continued Alen. The time went very fast. According to Halitopo, the eye witness who told the story to them suspected that Matias was already dead before he entered the boat. “They drove the ship quite far into the centre of the lake. They then returned to where the Avanza was parked and hereafter moved to Waena Mega Mall,” he said. The eye witness is very well acquainted with the family (Matias’ family?) in Sentani. “He immediately telephoned us during the event of the shooting at the estuary. Three people fell into the water,” said Alen. At that time, said Alen, KNPB members could not go to check because the moment had already passed. The Police were on guard everywhere. “The same morning, I sent two people to the location. A good friend of Matias’ stood rigid in a fishing net. They pulled his head and flipped his body to take two to three photos,” he said. A KNPB member cannot take a lot of photos. Maybe there were the people who telephoned the Police. Because it was not long before the Police arrived. The friends fled from the location. They went home and thought maybe the police will contact them. “We will see. Mr Pilipus Halitopo contacted us to go see the corpse which was located at the Bhayangkara hospital. We went and checked that it was actually a member of the Sentani KNPB,” he said. When the KNPB director arrived at Bahayangkara hospital, police chief Abe, AKP Decky Rumpasanny said something that was not plausible. “Police chief Abe said to us, how could you eat this raw (kami-kamu baku makan itu bagaimana – an expression, meaning “how can you accept this raw story as fact?”)? Maybe he meant the Sentanti person who killed Matias. We are not consumed (we are not concerned) with the issue,” he said. According to Alen, KNPB could not believe that irrational sentence because he had found out the chronology of events just recently from the eye-witness. “We don’t need to kill anyone, when it is not related to the conduct of Indonesia’s security force,” Halitopo asserted. Previously, The AKBP Jayapura Police Chief, S.IK to journalists in Jayapura stated, the corpse which was discovered is named Matias Tengket, found by a citizen and is located in Polri Bhayangkara hospital in the capital. From the hospital reports it was revealed that there were no signs of violence or mistreatment to the victim’s body, therefore it has been determined to have not been related to the riot pursuit towards KNPB actions. While the corpse is bruised, according to Police, it is suspected that the victim recently passed away or shortly before being found. The family of Matias Tengket has refused to have an autopsy performed on Matias Tengket. 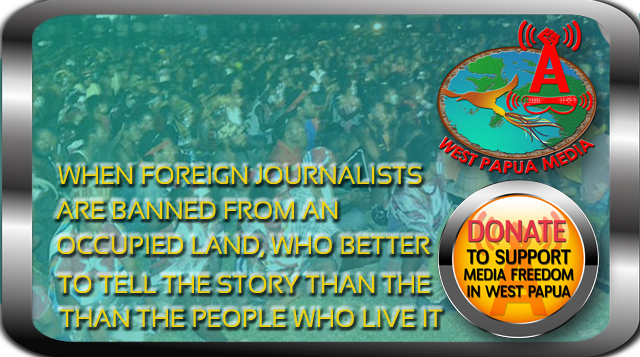 WPM apologises for the delay in posting due to the remote location of the WPM team, and the delays in finding independent witnesses to help in cross-checking of this extreme situation. This situation is developing and will be updated as more information comes to hand. Images from the crackdown in Jayapura (Credit:West Papua Media/MS); Images from Arrests in Timika (Credit: KNPBNews.com); and Wamena (Credit: WestPapuaMedia/KNPBNews.com). Police Chief Paulus Waterpauw and Papua Police Chief Tito Karnavian allegedly sighted monitoring the situation from their private Kijang vehicles. In addition, independent media website Suara Papua has been subjected to a denial of service attack, after they published accounts conflicting from the official police version of the story. It is believed by many season observers on cyber conflict in Indonesia, that this is the work of a shadowy cyber- division of the Indonesian police trained and funded by the Australian government, despite the fake outrage generated by the Canberra-Jakarta spy scandal. In news to hand just before publication, two more bodies have been recovered from around Jayapura suffering gunshot wounds, though it is unconfirmed whether they were victims of the November 26 shootings, or further murders by security forces. A highly credible source reported to West Papua Media that on November 27 at 3.30pm, a Papuan youth named Ottis Membilang (17), was shot by two TNI soldiers. According to witnesses, Membilang was standing on the side of the road in front if his home near the Mega store at Waena when 2 TNI members arrived in an unidentified vehicle and shot and killed him for no apparent reason. This is within metres of the area that West Papua Media’s witnessing survivor of November 26’s violence described troops and police driving around in Avanzas, wearing balaclavas and threatening to shoot all nearby Papuans.